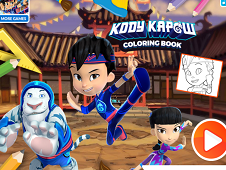 Kody Kapow Games is a new interesting category appeared on our site, a category where you are going to get a lot of challenges for girls and boys. In this new category you are going to get all kind of games. One of them is a creativity game where you have to color a lot of images from a coloring book. You have there images with all the main characters from the new Sprout animated television series. First you will select an image from the list from the right side of the screen. Then you will get the colors for that image. You have a lot of colors to chose from and I am sure you can find what you need to complete your goal. Do your best to make the images come to life. If you focus I am sure you can make a great job. 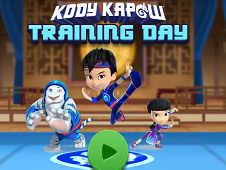 Leave us a comment to tell us what do you think about Kody Kapow Games category. Leave us a comment about the main character from the show and tell us which was your favorite game. If you love the job you have made in the coloring game you can save some images in your computer or print them to have cute memories with Kody and his friends. In another game you are going to have some fun with Kody. You have to move the hero in order to help him avoid being it by the wall that is coming from forward. If he is hit you will lose a life and you have to restart the level. If you lose the lives the game is over. Try to learn from your mistakes if you want to complete your goal successfully. In this new challenge appeared on our site the score is important so try to complete as many levels as you can in order to have a chance to reach the top of the best players. 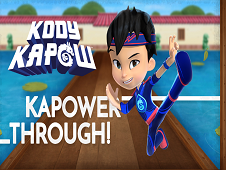 Another game from Kody Kapow Games category is a game where you will train the hero in order to improve his balance, focus and so on. Be careful at the indications before each challenge if you want to understand the rules. You need the arrows and the mouse to interact with these games. Give us a like if you had fun in the Kody Kapow Games category. Tell us if you want more challenges with Kody and other heroes from the show. If you do not know the new animation from Sprout we are going to tell you a few things about it. The main character is Kody, a 9 years old boy who visits his grandfather in China. He is going to become the protector of the village and he has to learn how to fight. His Master is his grandfather, Li, and they are going to have a lot of training sessions. Kody has to learn to control his powers in order to be able to protect the village. Mogo Monkey No Go is the villain from the show and he has an army of monkey minions that he is going to use to conquer the village. Kody is the only one who can stop him. He gets help from his cousin, Mei and from a cat tiger called Goji. Their secret weapon is the Sapphire Dragon. They use it to increase their martial arts powers. In the show you are going to see Kody and his friends in action trying to protect the village from the villains. I am sure you will lose the heroes because they have interesting personalities and they are brave and funny. If you are impressed by a hero you can tell us in a comment which is your favorite one. Give us a g plus if you want to help us promote the game for all the girls and the boys who love the new animated television series from Sprout. If you have fun watching the show I am sure you are going to love this new category from our site. I am going to bring you all kind of games here on our site, the best games site in the country. Do not give up if you fail in one game because the most important thing is to be persistent. YOU KNOW THIS ABOUT Kody Kapow Games? In Kody Kapow Games page you can find 3 games that we've published for these kids and children that are interested to play Kody Kapow Games, this game category have been created on 12.09.2017. These games with Kody Kapow Games have been voted a lot of times and we are inviting you to let a comment after each of this game.